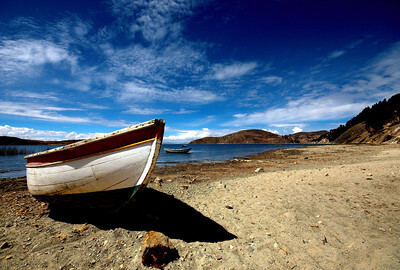 On the eve of the Bolivian national holiday, we left Copacabana with Nelly and Xavier and headed to Isla Del Sol, a peaceful island on lake Titicaca. While Bolivians and Peruvians got ready to party in the city, it seemed that every Western tourist in Copacabana was on a boat leaving the place. It took us about an hour to get to the southern tip of the island by boat, then another half hour of sweaty walking on dusty trails lining a steep ridge to get to the village of Yumani. Nelly had already booked us a lovely hostal, and Yann and I grabbed the room with the balcony overlooking the lake. We got a great price on our two night stay, although we discovered it wasn't as great a price when we were told that we would all be sharing the same toilet ... and that it didn't flush... and we were not the only four guests. But after just a few minutes of unwinding we were sold on the spectacular views and peacefulness of our new accommodation. 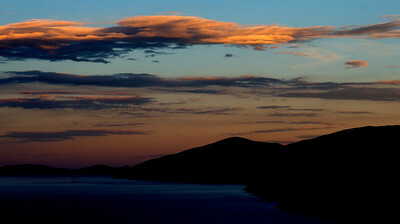 The entire island has about 2500 permanent residents, spread between three "major towns" of which Yumani is one. With the absence of roads, there is no motorized traffic, the running water is sparse and the electricity unreliable. 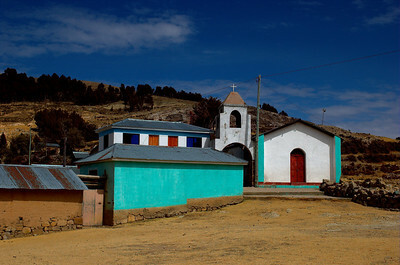 Yumani consists of about 100 or so homes (at least half of which advertise as tourist accommodation) and dozens of crisscrossing dirt lanes (used mainly by the local livestock). Even though the island terrain is rocky and inhospitable, most of the island is covered by fields (potatoes mainly), which would be tended to in the rainy season but now were quiet dried yellow plots. 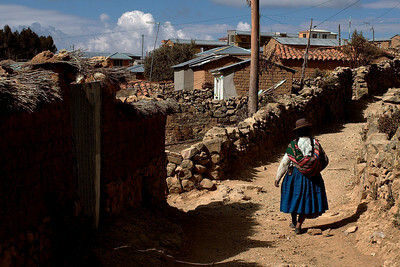 After admiring the views and rejoicing in the fact that we had chosen to stay two nights on the island rather than one, the four of us set out to find a Inca ruins a short distance from Yumani. We crossed only a donkey, a pig and three Belgian tourists on our way to the site, and found the two-storey Palacio del Inca was all to ourselves as well. 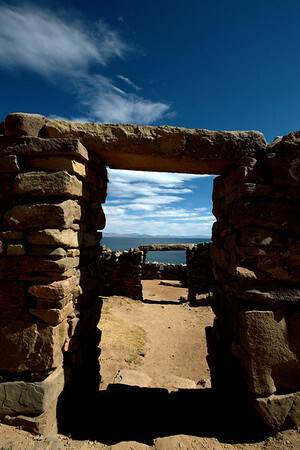 We wandered around the quiet site and admired the Inca construction set against the intensely blue Lake Titicaca. In the evening we searched for dinner, realising that the signs advertising pizza, pasta, steaks ... were somewhat of a stretch. 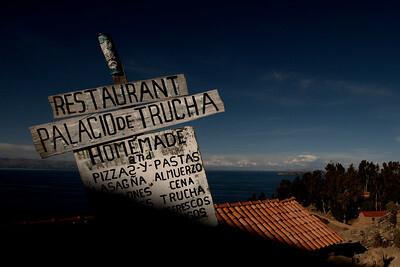 It appeared that there was exactly one thing to eat on Isla Del Sol: Trucha (lake trout) which we had already grown sick of in Copacabana. But we settled in a small restaurant and ate a home-cooked plate of trucha by candle light. We wandered back to our hotel through the pitch black village where we settled in the restaurant and played cards with Nelly and Xavier until the employees sent us to bed so that they could lock up. 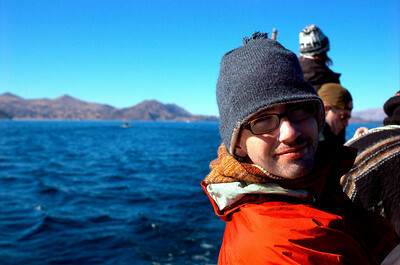 Our second day we decided to walk to the northern tip of the island and back. From the advice of a French tourist who had walked the trail on the previous day, we decided to follow trails through villages on the way there and on the way back follow a path built along the top ridge of the island (it took him 5 hours to do the trip, it took us 8). We passed mainly farm land and crossed very few villagers, other than toll collectors stationed outside villages to sell us our mandatory "permits". We passed one exasperated group of tourists who had turned back, refusing to pay for yet another tourist tax. I wasn't too bothered by it (for a change), although on the way back, Nelly finally put her foot down when we were stopped for a 4th time. The first "major" village we crossed was Cha'lla, which had a lovely turquoise church and a small beach, but not too much activity. After a few more hours of following trails up and down the side of the island we arrived at Challapampa, the northern most village on the island, set on a beautiful sandy beach in a quiet bay. A row of small outdoor grills were set up by villagers, selling french fries and sandwiches to the tourists disembarking from their tour boats. 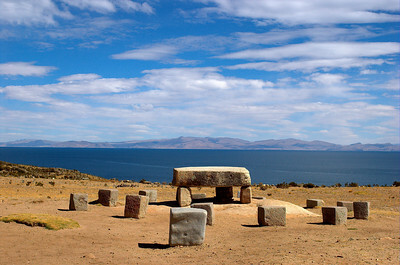 The main Inca ruins of Isla Del Sol are north of Challapampa. We were happy to have food and rest before setting out for our final climb to find them. The name Isla Del Sol was now seemed extremely fitting, with the sun feeling that much closer to us at 4000m in altitude. Any piece of skin that had escaped sunscreen got burnt (mainly our hands). We arrived at the Chincana ruins in the early afternoon and spent some time admiring the Mesa Ceremonica, the ceremonial table and chairs thought to have been a spot for animal and human sacrifice. We then walked to the main feature of the ruins, a maze of doorways and stone walls known as 'El Laberinto'. We made a half-hearted attempt to find its well containing sacred water and failed. 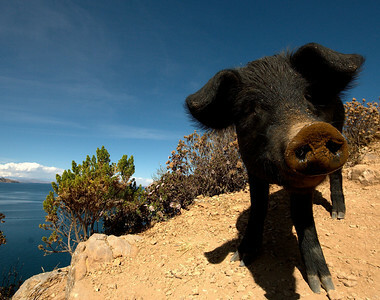 We returned to Yumani along the uninhabited top ridge of the island, allowing for beautiful views of the lake below and mountains around us. We pulled into Yumani in late afternoon and managed to find a restaurant selling "spaghetti" which was maybe a sell-out but was irresistible to the four of us who were pretty drained from our day. We all agreed that with a less tightly-packed schedule we would have spent quite a few more days on the island.